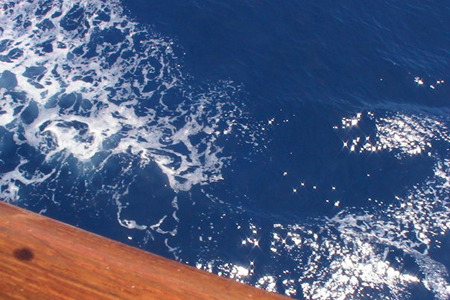 Is ocean fertilization really a viable way to slow down global warming? Ocean fertilization, the process of seeding the ocean with iron to instigate rapid algae growth, called an algae bloom, has been studied as one way to fight global warming. The idea is that through photosynthesis, the process by which plants use sunlight and carbon dioxide to generate their own food, the algae will remove carbon dioxide from the atmosphere, storing it harmlessly in the ocean. But despite this seemingly simple solution, recent research has demonstrated that ocean fertilization may do more harm than good. The main problem is that in order to effectively store carbon, the algae have to sink to the ocean floor. If this crucial sinking step does not happen, the algae will decompose near the ocean surface, reemitting carbon into the atmosphere. Research has demonstrated that as much as 50 percent and as little as 5 percent of the original carbon taken up by algae sinks below surface waters of 100 meters. And as little as 1 percent may make it to the ocean floor, about 500 meters deep, according to the Woods Hole Oceanographic Institute in Massachusetts. Algae are engineered to float, says Lutz. They store light oils and have gas vacuums that keep them from sinking. They were designed this way because like most plants, they want to be near sunlight, he says. Phytoplankton that sinks (and escapes becoming a fish’s lunch) does decompose in deeper water. The carbon dioxide could theoretically stay in the deeper waters for up to 100 years before circulating back to the surface, although this time frame is not completely understood and depends on how deep the algae is when it decomposes. The other problem with ocean fertilization is that, even if it does work, it could have many unintended consequences. Some research shows that ocean fertilization counters its objective and actually adds greenhouse gases to the atmosphere. One by-product of algae decomposition is nitrous oxide, which has 300 times the greenhouse gas effect of carbon dioxide, says John Cullen, oceanographer at Dalhousie University in Nova Scotia. Cullen says the effects of nitrous oxide could potentially counter any benefit obtained from ocean fertilization. Another problem is that adding carbon dioxide to the water makes it more acidic. Already, acidification effects from atmospheric carbon dioxide mixing with ocean surface water have been felt by marine life. The acidity eats at the coral reefs and the calcium carbonate shells of crabs, lobsters and other sea creatures. If effective, ocean fertilization would remove the carbon dioxide from the surface waters, but it would also just redistribute it to deeper water. And no one really knows how acidity would affect life in the deep sea. Even under the best circumstances, ocean fertilization could sequester a total of about one billion tons of carbon, estimates Ken Johnson, oceanographer at the Monterey Bay Aquarium. Meanwhile, we are emitting between seven and eight billion tons each year. The question that Johnson says needs to be answered is: “If we try to fix what we’ve screwed up, do we make things better or worse?”And at least for now, the science suggests that ocean fertilization is not the best option. Learn about red tide—excessive algae blooms that become toxic. Read about the effect of global warming on coral reefs. A blog post about recent research on the effects of climate change on the oceans. The obvious alternative is to engineer an organism that removes carbon (CO2) from the atmosphere and returns it to the geosphere long-term. I suggest an organism that converts the carbon into a form that looks like a grain of volcanic sand. This probably isn’t as hard as it seems, it just wouldn’t have evolved naturally since there is no evolutionary payoff. Our family visited Florida in October of 2007 and my oldest son is still suffering from sinus issues after being exposed to brevetoxin from the red tide that was occuring. His complications are minor compared to what others have had to endure and of course, Florida doesn’t want us to talk about it because it might discourage other tourists from going to it’s beaches. Stay away from red tides!! They are DANGEROUS!! Incentivizing the general public to combat climate change. With the skyrocketing energy prices and the credit crunch affecting more and more of us, it is no wonder that we are becoming more reluctant to act even if we don’t fool ourselves into a false scepticism about the human causes of global warming. Mother Nature has been around for billions of years and will always survive. What is not certain is our survival. We are talking about saving our home – the planet earth. We should make sure that our home is still habitable not only for our children but their children too. In short, we have to reduce our carbon footprint and our ever-increasing reliance on fossil fuels. High oil prices of recent years will go a long way to achieve that in part, this is a simple case of economics in action, but this will take too long. Rather than implicitly punishing us through global economic forces, possibly strengthened by green taxes the best way to achieve our goals of continued human civilization would be to harness those same economic forces and incentivize the general public to take action. There is a company called Solar Energy4All, who are offering people the opportunity not only to save on their electricity bills but at the same reduce the amount of CO2 being emitted into the atmosphere, by installing solar photovoltaic systems in areas where sunshine is in ample supply. IAs electricity generation is responsible for nearly 40% of all CO2 emissions, it’s a great start. And it’s a start that we can all make to our individual and collective benefit. Don’t wait for the politicians to solve this – show the politicians that this is really a case of power to the people. So why not visit their website, http://www.solarenergy-4all.com do yourself a favour, do mother nature a favour and above all do your children a favour. If I buy pv, will that be enough to protect my world from global warming? And how are you going to get China and India on board? Your push for, what may be your company, may make income for you but with 22+ billion tons of CO2 per year, the world needs much more grandiose schemss; and I’m afraid the politicians are going to have to play a major role in getting there. This article is full of misleading statments about ocean plankton blooms and it misses the key fact of the dire crisis of ocean life entirely. It is a fact that ocean plant life is going extinct at a rate far in excess of rainforests. In the past 30 years 17% of green plants are gone from the N. Atlantic, 26% from the N. Pacific, 50% from the sub-tropical tropical Pacific. This loss of standing biomass represents billions of tonnes of CO2. More important it represents the health and vitality of the oceans. IN fact up to 50% and more of large dust, read iron, stimulated plankton blooms sink. 30% alone is pooped out by zooplankton at depth. Forest sequestration is measured by standing biomass not how much sinks into the deep soil. Such illusions of sea bed carbon is spin mastering science bafflegab meant to misinform or promote academic debate amongst those more interested in their egos than the ecos. The issue of ocean ecorestoration is NOT about climate change it is about OCEAN CHANGE and slowing now rapid and deadly acidification and extinction of ocean green plants. Monetization via climate change mechanisms is but a tool that could help save the oceans. Fact: The hundred gigatonne fossil CO2 carbon bomb now impacting the oceans will continue to acidify the ocean and destroy ocean plants for the rest of this century even if we don’t emit one more molecule of fossil CO2. Only by restoring ocean green plants can the terawatts of fossil fuel derived CO2 be mitigated with equally potent terawatts of solar powered ocean green plants. Those green planktos will covert certain ocean CO2 death into ocean life. This is NOT about terrestrial life and discomfort this is about the survival of the oceans which demands restoration of the majority of life on this small blue planet, life from which we all came. How is it we can understand the wisdom of preserving and restoring forest on land but seem to think the ocean forests will be just fine if we do nothing on their behalf and to counter our hundred years of poisoning them. More harm than good??? That is absurd we are looking at the status quo being utterly lethal and utterly unavoidable if we do nothing. That is more harm alone. And by the way do conserve and use less fossil fuel that will help the future ocean but not the present ocean. The CO2 dose already administered is what we should be concerned about. Well written and important article!